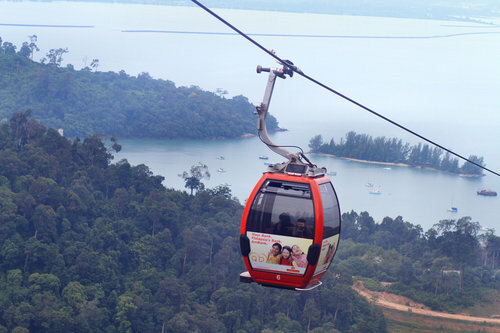 Langkawi's cable car ride is one of the most unforgettable thrills we have ever experienced. This is one of the world's most awesome cable car rides. Why? Because this ride to the top of mount Mat Cincang takes you to a height of 708 meters in about 15 minutes through the steepest cable car gradient in the world and offering breathtaking views of the mountains, valleys, islands and the Andaman Sea. The entry to the cable car is at the Oriental Village located at the foothill of Mount Mat Cincang in Patai Kok. 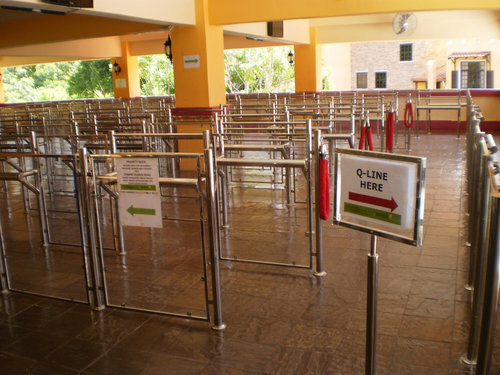 Once you buy the tickets at the counter, you will be guided to the waiting area and move towards the cable car pedestal in a queue. The gondolas (cable cars) keep coming every half a minute or so. Each car has a capacity of six persons. If there is a queue, six persons will be required to get into a car. In several occasions I had the opportunity to ride the cable car all by myself. You will actually have to hop into the gondola as it keeps moving in the pedestal. Before it takes off, the doors will close automatically. There is a slit (small window) on top of the cabin which serves as the only ventilation. There are two sections of the ride. The first section takes you to the middle station, and the second section to the top station. The gradient or the slope in the first section is supposed to be the steepest in the world (42°). As the gondola starts moving up, you will feel how the temperature starts dropping quickly. You will soon get cool breeze flowing in through the ventilation slit. If you look up, you can see the middle station far way up on a ridge top, if you look down you can see the buildings of Oriental Village with their gabled red roofs and becoming tinier by the seconds... it's an awesome sight. The total distance covered in the ride up to the top station is about 2.1 kms. On the way you get fascinating view of the mountain flora, rain forests, valleys, waterfalls and sometimes even wildlife and many types of birds on the ridges. Once you reach the middle station (which is at a height of 650 meters), you can get off here or alternatively decide to move on to the top station. At both the stations there are viewing platforms to soak in the marvelous sights all around. However, the view from the top station is even better and more breathtaking. While leaving the middle station, prepare for the unnerving jolt in the cable car. The feeling is more scary as you come down. However from the middle to the top station the gradient is easy and the cable car essentially traverses from one peak to the other at a gentle slope. So what can you see from the viewing platforms? Actually there are two such platforms at the top station, one on the left and the other on the right of the cable car station. There are two short flights of stairs to reach up to the platforms that offer 360° views. On a clear day you will see the many tiny island scattered in Andaman sea down below, the blue waters, towering mountains, caves and overhanging cliff walls in a panoramic setting. You can also see some parts of Indonesia towards south west and Thailand towards north. On one side you will see the Langkawi Skybridge, a magnificent curved suspension bridge which is one of the greatest feats of engineering. You will need to walk on the bridge to believe the kind of creation it is. You get a different perspective of the surroundings as you walk over it. You can reach the bridge from the top station. 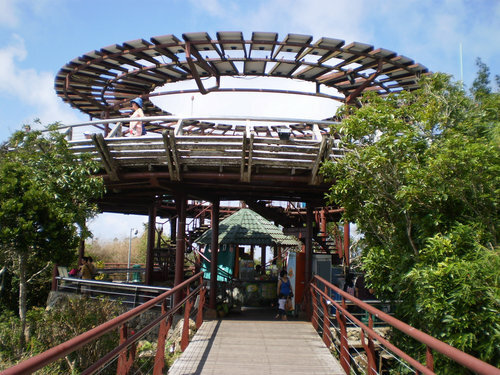 There is a walking trail known as Sky Trail from the top station that goes down to the middle station and then all the way down to the base station and also to Seven Wells (Telaga Tujuh) waterfall. The trail goes through forested land. The entire stretch is about 2.2kms. While walking down may not be difficult, walking up can be quite arduous. Plenty of activities and facilities are offered at base station and at the upper stations so that you can spend and enjoy ample time here. The base station is at Oriental Village which is full of quaint stores and eateries. There is a small cafe at the top station selling all kinds of snacks including burgers, grilled sandwiches, chicken and fish items, cold drinks etc. You will also find local artists offering to make a sketch or caricature of your face right in front of you. Or you can buy a photo souvenir capturing an instance of your own ride. There are small handcrafted items, souvenirs & gifts sold at the stations. One of most interesting ones is the replica of your hand that a craftsman makes with wax and you can choose the colors. You will also find kiosks for reflexology which is kind of a foot massage that you can take while enjoying the great views all around. There is a post box at the top station at an altitude of 708 meters from where you can post a letter, a postcard or a greeting card to anyone you like anywhere. There are free toilets and washrooms. Skydome: A hi-tech 11-meter fulldome theater has been installed outdoor in July 2014. It can accommodate up to 50 persons and offers spectacular 360-degree 3D projections of galaxy, astronomy etc using 12 projectors. The shows take 10 minutes each and run between the cable car arrival and departure. It helps making the waiting time enjoyable. The total inclined distance covered by the cable car from the base to the top station is 2.16 kms. The middle station is at a distance of 1.7kms from the base. 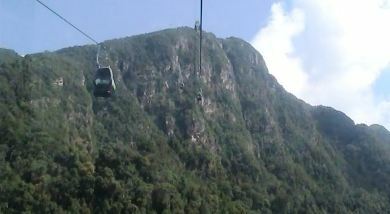 The vertical rise to the top is 680 meters although the top station is at an altitude of 708 meters from the sea level. The haul rope has a diameter of 50-milimeters. The Malaysia Book of Records has endorsed the Langkawi cable car having the longest free span single rope of 919.5 meters. This longest free span is between the second tower and the middle station. Although the design speed is 5-meters per second, the cable car is operated at a speed of 3-meters per second. It was constructed during the period April 2001 to August 2002, and was opened to public in October 2002. Public enjoyed free rides during the first month. One way journey takes about 15 minutes (round trip 28 minutes) excluding the waiting time at the stations. If there is a lot of rush, try to avoid getting out at the middle station on your way down. If you do, you might have to wait for a long time to get a gondola with vacant seats coming from the top station. They will keep coming full. Secondly, there is nothing more to see at the middle station compared to the top station. Sometimes, particularly on public holidays and weekends, there can be a huge rush. It can also happen if there is a cruise ship at port when large numbers of passengers come here as part of cruise excursion. You will need to line up at the ticket counter (which can take some 45 minutes if there is a long queue), then again queue up at the waiting area (another 45 minutes) until you get your turn to board the cable car. So try to reach early and few minutes before the counter opens. You might be able to avoid the queue. On a rush day (or even otherwise) do not release your taxi. Although taxis are available near the entrance of Oriental Village complex, on some days you won't find any. We often take a taxi on an hourly rate (RM25 per hour) whenever we visit cable car and other nearby attractions. The cable car operation is subject to weather conditions. During inclement weather, they do not operate the cable cars. So on such days, call them up and check before you go. If there are clouds at the top, you wont get any views or may be limited views. You can actually make it out from the ground level whether you can get good views or not once you reach the top. Ask the taxi driver and he will let you know. If it is clouded, you may decide to take the ride on some other day, and rather enjoy Oriental Village along with many of its other attractions and activities here. On a sunny day, it is usually very hot up there. So wear a cap, comfortable clothes and walking shoes. Sometimes the cable car remains closed due to scheduled maintenance. Call them up and check out the schedule before you go. Ask for a free souvenir and brochure at the ticket counter. They give you a nice badge and a foldable brochure, if in stock. Adult: RM45 per adult. Child (from 2-12): RM30. Includes Skydome. There is no time limit once you enter as long as you come out by the time it closes for the day. Express Ticket: RM95 per person. You can avoid the long queue at the waiting area. Includes Skydome and SkyRex. The above rates are for foreign tourists. Malaysian citizens with Mykad cards have lower rates. Combo tickets are also available combining cable car with 6D movie, duck tour, sky dome etc. Panorama Langkawi Sdn. Bhd. 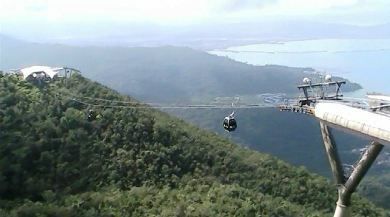 is the company that operates the Langkawi Cable Car. It's located at the north western side of Langkawi in Patai Kok area. 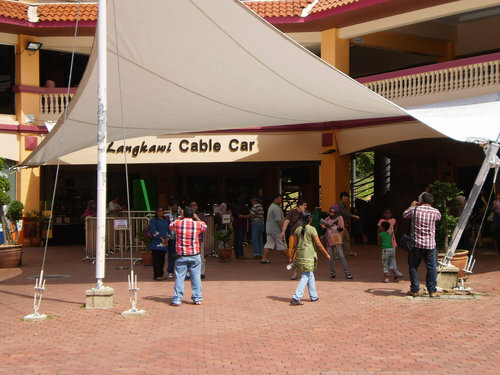 You can take a taxi or a rental car to reach the cable car which operates from the Oriental Village. One way taxi fare from the Pantai Cenang to Oriental Village is RM26 and takes about 20 minutes to reach. Kep the taxi waiting or else you may not get one for your return. 1) Langkawi Sky Bridge: A great suspended bridge hanging on top of Mount Mat Cincang which can be reached from the top station of cable car. 2) Oriental Village: A nice open air complex with many shops, restaurants, attractions & activities. 5) Pantai Kok Guide: All about Pantai Kok including activities, hotels, restaurants, shopping etc. 6) Langkawi Attractions: All the top tourist attractions in the island. Hi . we are visting langkawi in april 2017 and want to know if the cable cars will be operating ... somebody said that they close for maintenance, let us know . See the month-wise operating schedule on their official website which indicates the days the cable car is closed for maintenance or other reasons. Hi Raj, Your posts are very informative. I am travelling with my family (my husband and my 1.5 year old daughter ) to Langkawi in August. So please let me know if it will be possible to take a cable car ride with my daughter as she will be only 1.5 years during that time. Are there any age limit or height limit to travel by cable car. Hi, There is no age restriction specified for cable car ride. The child fare starts from age of 2 to 12 years. So below 2 years a child should travel free. But you should use your own discretion in such matters (i.e. whether to take your child for the ride or not). Hi, The Sky Bridge (accessible from the top station of Cable Car) is currently closed for maintenance & upgrades, however the cable car is operational. If you want to reserve a taxi, you need to do it for minimum of 4 hours (@RM25 per hour). One way taxi fare from the port (Star Cruise Jetty at Pantai Tengah) to Cable Car would cost around RM35-40. So it would be wise to reserve a cab, as getting one back from the cable car may not always be easy. Secondly, you will have option for some sightseeing before you return.